17/10/08 Gateshead’s Students are the Best - its Official! "Former Appeal Court Judge Sir Paul Kennedy has cleared me of making improper claims against my Parliamentary Allowances. 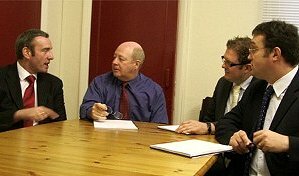 Sir Paul has said that there was nothing improper about the arrangements I made in the summer of 2004, that it was made for a proper purpose, it was fully disclosed at the time, it did not cast any additional burden on the public purse. "He has therefore allowed my appeal. "I want to thank all those members who have ignored the press sensationalism and have been so supportive of Brenda and me through this difficult period." "This has been a horrendous period, it really has. It is a very difficult thing to go through, both for myself and for Brenda, my wife. Over the last few months since the Telegraph began its stories we have faced claims that something we have done was wrong. "I think the original order to repay money must have been based on the Telegraph's claims and not on the full evidence, and I'm glad that has been corrected." "I didn't want to go out after 24 years of working hard for my constituents with this hanging over me. I did nothing wrong and I'm glad that has been proved. "Now I want to get back to working hard for the last few months before an election is called." "I am now coming up to 67 and a 4 or 5 year Parliament will take me beyond the age of 70. "There are other, personal, reasons but certainly the recent death of a colleague at the age of 63, who will now never enjoy his retirement, has convinced me to reassess my position. So, I have decided to retire and give Gateshead Labour Party the opportunity to select a new candidate. "It has been an honour and a privilege to represent the people of Tyne Bridge these past 24 years and I sincerely thank those who have supported me and extend best wishes for the future to all my constituents and the many local organisations I have worked with." I am writing to let members of the Gateshead Labour Party be the first to know that I have decided to retire at the forthcoming General Election and that I am withdrawing my candidature with immediate effect. When I was selected by Party members to be the candidate, back in 2006, it was fully expected that the next general election would be in May 2009, when I was not yet 66, indeed there was almost an election in 2007 as we all well know. As it is I am now coming up to 67 and a 4 or 5 year Parliament will take me beyond the age of 70. There are other personal reasons but certainly the recent death of a colleague at the age of 63, who will now never enjoy his retirement, has helped convince me to reassess my position. So, I have decided to retire and give the Party the opportunity to select a new candidate to represent Gateshead Constituency in Parliament. This has not been an easy decision and I am very disappointed that I will not now have the opportunity to become the Member of Parliament for my beloved home town of Gateshead. I will, of course, continue to do my job as MP in the usual way right up to the election but I want to take this opportunity to thank you for your support and comradeship over the years. I know you will go on to select a strong candidate to represent our constituency during the difficult years that lie ahead and I will do all I can to assist in that process. I will continue to play a part in the Party and our community when no doubt our paths will cross from time to time but in the mean time I sincerely wish you and your family good health and good fortune for the future. Tyne Bridge Labour MP David Clelland today welcomed the announcement of the seven and a half billion pound investment in the development and building of the new Super Express trains. ‘This is fantastic news’ said David Clelland, ‘This is a huge opportunity for the north east with a project that’s easily as big as when Nissan first came to the region. I’ve had discussions about bringing the project to Gateshead with the Secretary of State for Transport, Geoff Hoon, as well as with Cllr Mick Henry, Gateshead Council Leader and Chair of the Association of North East Councils (ANEC). It’s vital that ANEC works closely with ONE North East and north east businesses to pull out all the stops to secure this manufacturing facility in the north east - the whole of the north east has got to get behind this bid, just as we did with Nissan. ‘The north east has a long and proud history with the railway industry. Gateshead has been a big player in the industry in the past, and I hope we can be in the future. I’ll certainly be doing my best to work with all the interested parties to secure this important project for the region. Gateshead’s Students are the Best - its Official! The commitment and dedication of Gateshead’s students were praised today by Tyne Bridge MP David Clelland and Jarrow MP Stephen Hepburn. The summer’s GCSE results clearly show that young people from Gateshead’s secondary schools have had the biggest percentage improvement since 1998 - with a whopping 35% improvement in the number of students achieving 5 or more A to C grades in 2008 as compared with 1998. "Now that the summer’s results have been analysed, we can see that over 64% of students achieved five or more A to C grades, smashing through the Government’s target of 60% for this year." "These are very positive results that build upon the improvements of the last decade. I congratulate pupils and schools on their sheer hard work. Five higher level GCSEs with the all-important maths and English passes are a good academic achievement, so let’s give credit where credit is due." "These are excellent records of improvements year on year but we should also remember that this isn’t only about bare statistics - many of Gateshead’s students have improved academically in ways that cannot be measured just by exam results, and we must celebrate their achievements too." "Lung cancer is a devastating disease, affecting more than 37,000 Britons a year. But it can be successfully treated if it's picked up at an early stage, when treatment has the best chance of working. "November is Lung Cancer Awareness Month. It's vital that people know the signs and symptoms of the disease, and pharmacies are a good place to pick up information. I'd also urge my constituents to make sure they go to their GP if they are worried they may have symptoms." 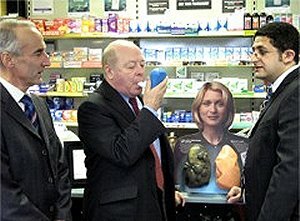 "It is great news that Lobley Hill Pharmacy is using Lung Cancer Awareness Month to raise awareness of the disease. Put simply, early detection of lung cancer can save lives." Lung cancer is the most common cancer in the world, claiming the lives of 33,000 Britons every year. "Pharmacies are at the heart of local communities and many people come to their pharmacist for information and advice about their health. We want to make sure we do our bit to make sure people know the signs and symptoms and encourage them to seek advice from their GP. "We can also support people who are interested in quitting smoking, through our in house stop smoking service which offers Nicotine Replacement Therapy and up to twelve weeks of counselling and support. "Stopping smoking, or preferably not starting in the first place, is still the best chance of reducing your risk of developing lung cancer." David has been selected to be the Labour candidate for the new Gateshead constituency. The constituency has come into being as a result of changes made by the Parliamentary Boundaries Commission which reduced the number of constituencies in Tyne and Wear from 13 to 12. The new Gateshead constituency was formed by merging part of Tyne Bridge constituency with part of Gateshead East and Washington West constituency. This meant a head-to-head battle with the MP for Gateshead East and Washington West, Sharon Hodgson. At a selection meeting held on Saturday 16th December the members of the local Labour Party chose David to be the candidate for Labour at the next general election. "I was born and bred in Gateshead, served for 14 years on the council and have been an active member of Gateshead Labour Party for 36 years. Gateshead runs through my veins, it is a natural seat for me and I am absolutely delighted that my colleagues have enough confidence in me to have chosen me fight this seat at the next general election." Local MP David Clelland will be taking up the cudgels on behalf of post offices in Gateshead when he meets sub-postmasters from across the borough during a Parliamentary lobby tomorrow, Wednesday 18 October. "The Post Office has to adapt to reflect the changing ways in which people conduct their lives. Changing technology means that people simply aren't using post offices as they once did. But sub-postmasters know that, and are eager to access new opportunities to develop their businesses. Knowing that the Post Office Card Account will be phased out in 2010, and the BBC decided on commercial grounds to withdraw its licence work from post offices, sub-postmasters in Gateshead want to be able to offer new services. "This isn't a question of feather-bedding post offices - we all recognise it's a harsh competitive world out there. But it is a question of recognising that the post office is the mainstay of a community's micro-economy. Not everyone can jump into a car and drive 12 miles for a pint of milk. But post offices are businesses, not charities, and without a profitable core, will soon cease to exist. "So I want post offices to be able to provide a range of other services. Why can't all post offices also offer the same services to license vehicles, issue driving licences and process passport applications? Why can't they all offer personal loans as well as foreign currency transactions? Camelot themselves decide where to site their lottery terminals but perhaps government should be insisting that post offices would provide appropriate locations." Tyne Bridge Labour MP David Clelland welcomed the Government's new Corporate Manslaughter and Corporate Homicide Bill when it was debated in the House of Commons this week. Tyne Bridge Labour MP David Clelland has launched an internet petition calling on Ministers to review the regulations covering entitlement to the Carers' Allowance. 'At present, the Carers' Allowance of £46.94 is paid to someone who has already been awarded the highest level of disability benefits because of the severity of their physical or mental health problems. David Clelland took with him a little bit of Gateshead when he was selected to represent the UK Parliament at the annual outdoor sitting of the Tynwald, the Manx Parliament. The annual Tynwald ceremony, which dates back to Viking times, has remained virtually unchanged and for well over 1,000 years the inhabitants of the Isle of Man have gathered at Tynwald Hill to hear their laws proclaimed, to seek justice and to air their grievances. No other parliament in the world has such a record of unbroken sittings. But in a new twist to the ceremony, the Tynwald decided to mark the Millennium with a cairn made up of stones brought from the homeland of their guests. For David, there could only be one choice. 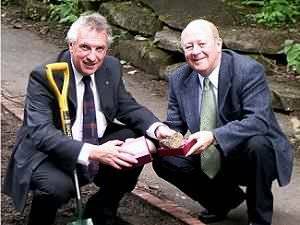 His stone had to come from Saltwell Park. Tyne Bridge Labour MP David Clelland has used a visit to the Gateshead Carers Association in Carers Week to highlight some of the problems faced in particular by working carers. 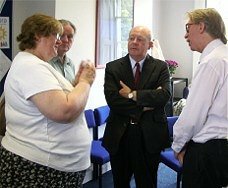 During his visit, David called for a review of the rule that says that anyone earning more than £84 per week cannot qualify for Carers Allowance. "I am delighted that, in April next year, the Government will be introducing the right for workers to request to work flexibly, a boon for carers trying to balance their working life with their responsibilities at home. "But I'm very concerned that carers are effectively stopped from earning any extra money by the limits imposed by the Carers Allowances rules. I want the Government to look again at the entitlement limits- there is an army of carers out there who provide a high level of care, day in day out, and go out to work too. Their contribution is absolutely indispensable and these earning limits need to be reviewed." David also called for regular health checks for carers, adding that the physical and psychological strain faced by the UK's six million carers is creating a vicious cycle of health problems, according to a survey carried out of more than 5,000 carers. The most common complaint was stress and worry (91%) arising from the emotional impact of caring whilst backache (50%) demonstrated the physical toll on carers' health. 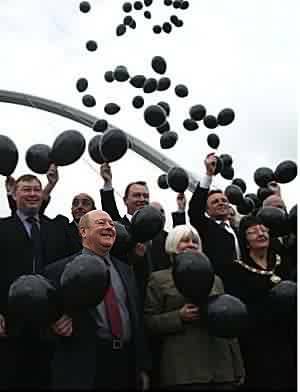 There was confusion for the kittiwakes, and a brief eclipse of the June sunshine, when 15,000 black balloons were released on the Gateshead Millennium bridge by Tyne Bridge MP David Clelland, Newcastle and Gateshead's Mayors and councillors from each local authority. The balloons represented the 15,000 tonnes of carbon emissions that have been saved as a result of energy efficiency measures installed in homes across Gateshead and Newcastle by the Warm Zone Project. "This is a very effective way of marking World Environment Day. The sight of so many black balloons is a very dramatic reminder of how much carbon emissions can be saved by proper insulation and energy saving measures. The Warm Zone scheme gives free advice to any resident, and can actually help pensioners, or those on low or fixed incomes with the costs of central heating and insulation. "A call to Warm Zone can save the environment and save you money. An unbeatable combination!" Tyne Bridge Labour MP David Clelland met with leading members of the North East Chamber of Commerce in a bid to push the Going 4 Jobs Campaign further along the route of success. "The Chamber of Commerce sought a meeting with me so that we could discuss progress on the Campaign so far, and particularly with regard to transport issues such as the possible impact a high-speed link might have on the region, the state of the rail network and, of course, the stifling impact of Article 14 orders on the region's economic growth". "As a member of the Transport Select Committee, and because I have a gut belief that transport is the essential artery of economic development, I promised to continue to raise these issues in Parliament. And today, in a Transport Select Committee meeting with Roads Minister Stephen Ladyman, I was able to raise the whole question of regional transport allocations, the disparities in regional transport spending and investment, and the need for more local control over transport matters." "He didn't get away from me after the meeting either. I spoke to him about his promise to visit the region and see the impact of Article 14 decisions and transport decisions on the region's economy. He's promised me that he will definitely come towards the end of the month, and told his staff to find a date." Tony Blair's got one, Michael Howard's got one. Even Charlie Kennedy's got one, and now Tyne Bridge Labour candidate David Clelland has got one too. Except that his isn't a 22 ft long battle bus. 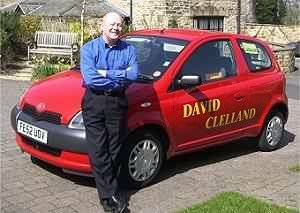 David can be seen driving around Tyne Bridge in a specially painted Toyota Yaris. "I'm sure that I can be just as effective in getting Labour's message over to voters - if you value it, vote for it." 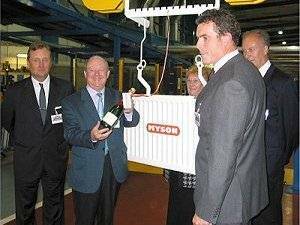 On Tuesday 12th October David performed the official opening of two new production lines at Myson Radiators on the Team Valley Industrial Estate in his Tyne Bridge constituency. The £18 million investment was supported by a grant of almost £2 million from the DTI and secures the employment of more than 300 people at the plant and others employed by suppliers. Myson's parent company, The Rettig Group, had thought of putting this investment into Poland but the DTI grant and the excellent Team Valley facility helped secure the investment for Gateshead. 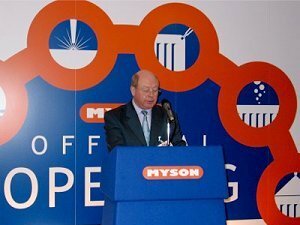 "Myson deserve praise for the determined way in which the company has sought to modernise, to widen its product range, to compete in a very competitive world. Indeed, so successful have the company's efforts been that the name "Myson" has become synonymous with a wide range of heating products. The reality is that the extension that we're here to see today would not have been possible without a very substantial investment of an £18m cash injection from the Rettig Group, the parent company supported by a grant of almost £2m from the taxpayer via the DTI. We've seen investment in manufacturing industries decline not only here in Gateshead but across the UK for a number of years. But today, here at Myson, we can see the very visible evidence of manufacturing confidence in Gateshead and in the region. Because, as I understand it, this investment might have gone to Poland but, with the help of the DTI, the company will be able to benefit from a re-equipping of the whole factory and the introduction of additional new automated production lines. This investment is great for the company, its great for the workers employed here and its great for Region. What you are doing here is an example to manufacturers across the UK as they struggle to compete in an increasingly difficult world market. We cannot compete on the basis of poverty pay or poor working conditions. But we can on our levels of skill and efficiency and that is the future for British manufacturing. My congratulations to all concerned and best wishes for the continuing success of your business here in Gateshead and elsewhere."